Say Happy Birthday or send Get Well wishes with this eye-catching tabletop arrangement. 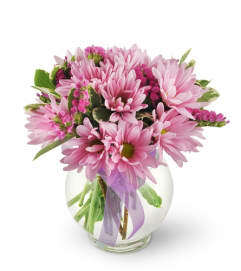 To The Top!™ features three hot pink gerbera daisies, delicate miniature carnations, and frilly white statice in a versatile centerpiece tray, and will lift his or her spirits right up to the top! 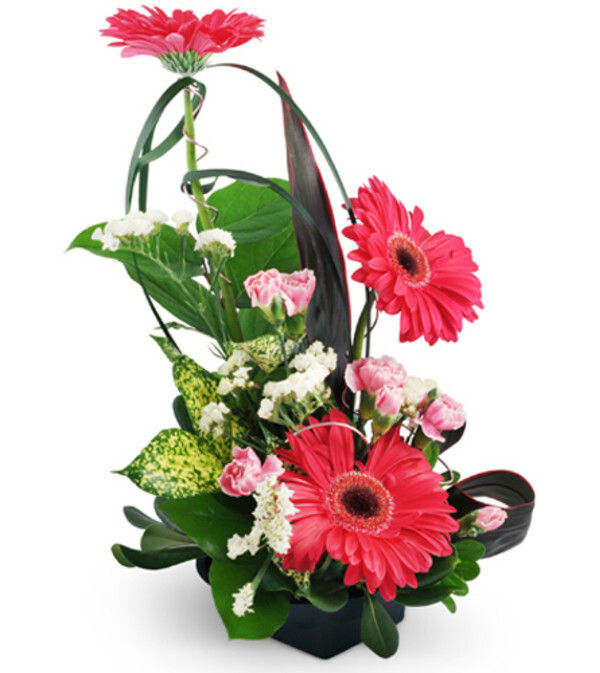 Gerbera daisies, mini carnations, and statice emerge from tropical leaves, salal, and monkey grass. I received a massive bouquet from an out of town sender and it was gorgeous! I couldn’t wait to let the sender know they were magnificent, which isn’t always the case at other places And especially a tele order. Its been two weeks and they look as good as the day they arrived. Its a lovely shop as well with beautiful and interesting things to purchase! Love this place!! Called from Oklahoma and was taken great care of. Such wonderful people to work with. 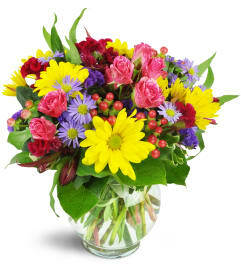 Pam's Posies is a Lovingly Florist in Akron. Buying local matters. Discover how Lovingly supports local florists. Copyrighted images herein are used with permission by Pam's Posies.